They're speaking less than half a mile — but worlds apart — from each other. President Donald Trump will be holding a rally in El Paso on Monday night where he's expected to reiterate his call for a wall or barrier on the southern border and echo the statements he made in his State of the Union address last week. "The border city of El Paso, Texas, used to have extremely high rates of violent crime — one of the highest in the country, and considered one of our nation's most dangerous cities," Trump said then. "Now, with a powerful barrier in place, El Paso is one of our safest cities." 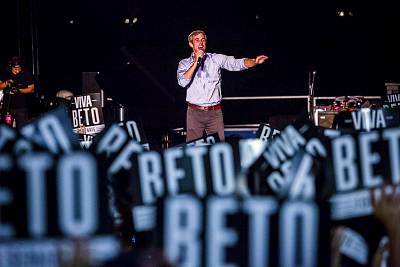 Former El Paso congressman — and possible 2020 Democratic presidential candidate — Beto O'Rourke, meanwhile, will headline the "March for Truth: Stop the Wall, Stop the Lies." The march will end in a rally where O'Rourke said residents will "celebrate our community" and "tell the true story about the border." "While some try to stoke fear and paranoia, to spread lies and a false narrative about the U.S.-Mexico border and to demand a 2,000 mile wall along it at a time of record safety and security, El Paso will come together for a march and celebration that highlights the truth," O'Rourke's office said in a statement last week. On their Facebook page, organizers urged attendees to "Wear white," Try to carpool or use rideshare," and "Bring a positive poster." The march will proceed along a section of fencing before ending in a rally at the Chalio Acosta Sports Center, less than half a mile from the 11,000-seat El Paso County Coliseum, where Trump is slated to speak. 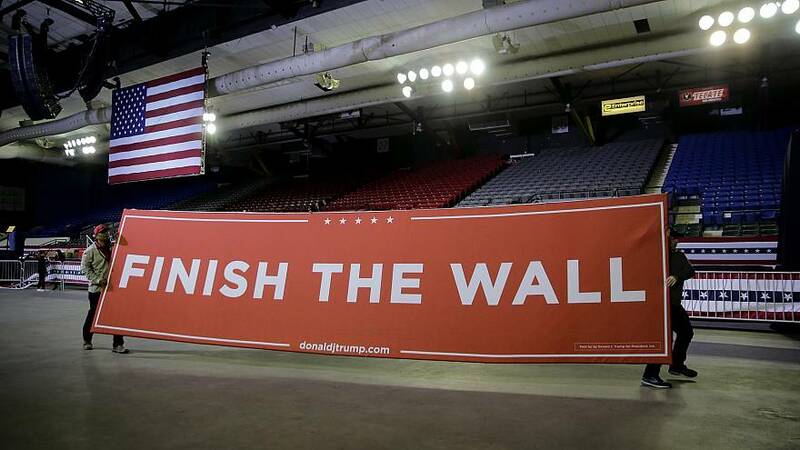 A large "Finish the Wall" banner was being hung in the coliseum Monday morning. Pro-Trump vendors were set up across the street Monday morning from where O'Rourke will be speaking, but the area isn't big Trump country. Trump won Texas by nine points in the 2016 election, but he lost El Paso County by 43 points — 69 percent to 26 percent. The president's trip is designed to rally public support for his call for a wall along the southern border. Democrats have refused his demand for $5.7 billion in funding for the wall, which Trump had said during the presidential campaign that Mexico would pay for. The impasse helped lead to thelongest shutdown in government history — and has stoked fears the government could shut down again after Friday, when the current spending deal expires. Trump has pointed to El Paso as proof that "walls work," and said that the barrier that was built there in 2008 and 2009 transformed it from one of the country's most dangerous cities to one of the safest. His campaign put out a video on Monday that it said featured El Paso residents praising the wall. "They put the fence up and ever since then, the crime rate has gone down dramatically," said one. Trump's claims have led to bipartisan pushback from El Paso politicians, who pointed to statistics that the city of 700,000 was never one of the country's most dangerous — and it had already transformed itself into one of the safest by the time wall was built. "El Paso was NEVER one of the MOST dangerous cities in the US. We've had a fence for 10 years and it has impacted illegal immigration and curbed criminal activity. It is NOT the sole deterrent. Law enforcement in our community continues to keep us safe," Mayor Dee Margo, a Republican, tweeted after the State of the Union. The county commissioners passed a resolution on Monday complaining that Trump had "continuously made inaccurate claims about the United States' southern border, including El Paso," and saying they're "disillusioned by President Trump's lies regarding the border and our community." O'Rourke tweeted that "we will meet lies and hate with the truth and a positive, inclusive, ambitious vision for the future."